The CQBY,PRRY,RQHY series of wagons all have the same origin – the Qiqihar Rollingstock Works in China. In June 2000, CFCLA received 50 x CQBY 3TEU 19.4m long skeletal container wagons. These wagons were and still are painted in a green colour. This batch of CQBY wagons are numbered from 0101 to 0150. Members of this first batch of CQBY wagons have seen service on hire to Austrac, Patrick PortLink/ Patrick Rail, Lachlan Valley Rail Freight, QR National, ASR/ARG, and Pacific National. They can be sighted on a daily basis on intermodal services across the Australian standard gauge network east of Adelaide to Melbourne, Sydney and Brisbane, together with also working on rural NSW container trains. These wagons generally carry 20ft, 40ft and 48ft long containers. In late 2004, CFCLA received another 75 x CQBY 3TEU 19.4 long skeletal container wagons. These wagons were and still are painted in the standard CFCLA blue colour. They were very similar to the first series of CQBY wagons, except the handbrake, twistlock and outrigger arrangements differed slightly. This batch of CQBY wagons are numbered from 2001 to 2075. Members of the second batch of CQBY wagons have seen service on hire to QR National, SCT and Pacific National. They can be sighted on a daily basis on intermodal services across the whole Australian standard gauge network from Brisbane to Perth. These wagons generally carry 20ft, 40ft and 48ft long containers. The CQBY wagons have been very successful – they are extremely reliable, have low maintenance costs, low tare weight, high payload, and are rated to run at 115km/h. 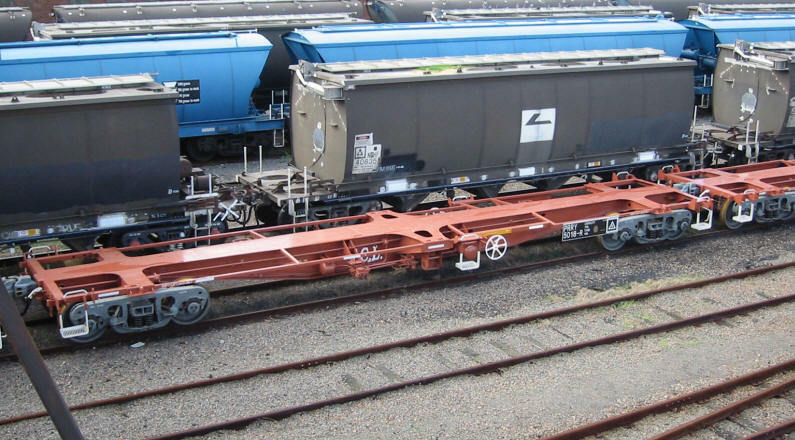 In mid 2005, FCL received delivery of 20 x PRRY 15.58m long skeletal container wagons, designed to primarily carry 1 x 48ft transport container, but also capable of carrying 1 x 40ft or 2 x 20ft containers. These wagons were painted in the standard FCL brown colour. The PRRY is very similar to the second series of CQBY wagons, just shortened. The PRRY wagons are numbered from 5006 to 5025. All 20 x PRRY wagons were recently sold by FCL to Pacific National, and have now entered service. They can be seen on any Pacific National intermodal service from Brisbane through to Melbourne and Perth. Pacific National shortly will receive 78 x RQHY 3TEU 19.4 long skeletal container wagons, which are expected to be identical to the second batch of CQBY wagons. The first delivery of RQHY wagons is expected to arrive in Newcastle by ship just before Christmas 2005. They will feature the now standard Pacific National blue and yellow livery. The RQHY wagons will be seen on a daily basis on intermodal services across the whole Australian standard gauge network from Brisbane to Perth. These wagons will be able to carry 20ft, 40ft and 48ft long containers.